Discussions Magazine Music Blog: YOJIMBO & SANJURO/The Criterion Collection on Blu-Ray! 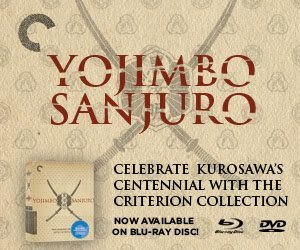 YOJIMBO & SANJURO/The Criterion Collection on Blu-Ray! Thanks to perhaps the most indelible character in Akira Kurosawa’s oeuvre, Yojimbo surpassed even Seven Samurai in popularity when it was released. The masterless samurai Sanjuro, who slyly manipulates two warring clans to his own advantage in a small, dusty village, was so entertainingly embodied by the brilliant Toshiro Mifune, that it was only a matter of time before he returned in a sequel. Made just one year later, Sanjuro matches Yojimbo’s storytelling dexterity, yet adds a layer of world-weary pragmatism that brings the duo to a thrilling and unforgettable conclusion. Yojimbo: To rid a terror-stricken village of corruption, wily masterless samurai Sanjuro (Toshiro Mifune) turns a range war between two evil clans to his own advantage in Akira Kurosawa’s visually stunning and darkly comic Yojimbo. Sanjuro: In Kurosawa’s sly companion piece to Yojimbo, the jaded samurai Sanjuro helps an idealistic group of young warriors weed out their clan’s evil influences, and in the process turns their image of a: proper, samurai on its ear.